NEW YORK, N.Y. American Jewish World Service (AJWS), the leading international Jewish human rights organization and a funder of 26 human rights organizations in Mexico, today issued a strong demand for Mexican authorities to resume their investigation into the disappearance* and possible murder of 43 student activists, who went missing in Iguala, Guerrero State, in September 2014 on their way to a protest against government violence. Mexican authorities have said the students were likely captured and murdered, although the remains of only one have been found, and yet the Mexican Attorney General has announced a halt to his investigation. No charges have been filed. At the time of their disappearance, the 43 students were preparing to travel to Mexico City to protest the massacre of students by government forces in 1968. In recent years, more than 23,000 Mexicans have either disappeared or been killed, and AJWS today called on the Mexican government to do more to protect the security of human rights advocates who are pursuing justice for these victims. “It is morally and legally unacceptable for Mexican authorities to stop their investigation into who is responsible for the disappearance and probable murder of 43 student activists, who were doing nothing more than exercising their human right to protest past abuses by the Mexican government,” said Ruth Messinger, President of American Jewish World Service. “This appalling decision demonstrates that authorities are not pursuing the fundamentals of justice, which requires holding those who commit crimes responsible for their actions. We stand with the human rights advocates we support in Mexico who are demanding information about these disappearances and seeking justice and reparations for the families of the students and all the people affected by the tens of thousands of such disappearances in Mexico in recent years, and we insist that the Mexican authorities ensure their safety and security,” added Messinger. Attorney General Jesus Murillo Karam has dismissed demands from the families of the 43 students for an exhaustive and transparent investigation of this matter, demonstrating once more that Mexican authorities hold themselves above the law and do not hesitate to violate the human rights of Mexicans. The families have called for an investigation by a multidisciplinary group of international independent experts, as prescribed by the Inter-American Commission on Human Rights. “We are alarmed that those who are responsible for perpetrating these crimes, including relevant state officials, seem to be above the law,” said Angela Martinez, Senior Program Officer for AJWS. “To achieve justice for the disappeared, their families and the Mexican people, we support the Inter-American Commission on Human Rights’ efforts to verify the technical qualifications of Mexico’s investigation, as it may clarify any irregularities in the process,” added Martinez. AJWS supports Mexican human rights organizations who are presenting an alternative report before the United Nations Committee on Enforced Disappearances. The report will request scrutiny of the situation in Mexico, where at least 23,000 individuals are registered as “forced disappearances.” The report will provide a deep analysis of the structural failures of the Mexican government in the prevention, investigation and prosecution of forced disappearances. AJWS has supported partners in Mexico in their efforts to achieve truth, justice and reparations for the families of the 43 missing students. 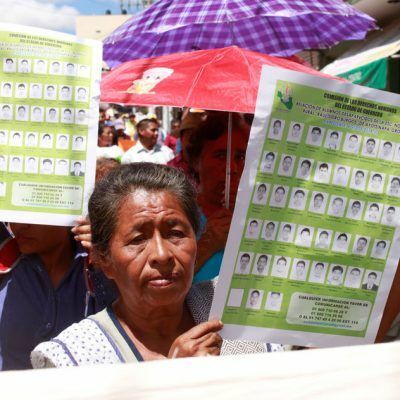 On January 27, the families of the students, along with AJWS partner Centro de Derechos Humanos de la Montaña Tlachinollan (Tlachinollan), articulated the top 10 reasons why authorities should continue investigations of the forced disappearances. Tlachinollan highlights that this incident is part of a large number of forced disappearances. The incidents, in which the state is implicated at a minimum due to its juridical inaction, continue to occur with impunity. *Forced disappearances occur when a person is abducted or imprisoned by the state, political organization or a third party. This action is accompanied by the responsible party’s refusal to acknowledge the person’s location or fate, with the intent to place those who have disappeared outside the protection of the law.